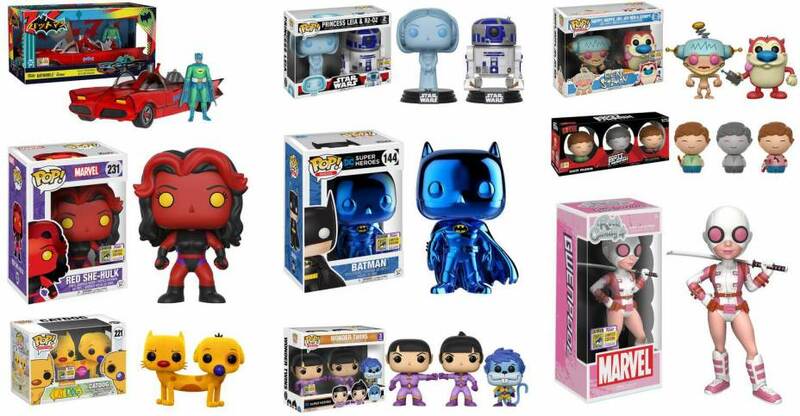 Over the past week, Funko has been sharing a wide assortment of San Diego Comic-Con 2017 Exclusives. The collectibles cover a wide range of licenses, including DC Comics, Star Wars, Marvel and more. Chances are, there will be even more, and we’ll update this list with those reveals as well. Check out the list below and read on for the photos. A Kotobukiya Japanese import! The Marvel Bishoujo collection, bringing you new interpretations of familiar superheroes and villains, adds Betty Ross to the lineup in her Red She-Hulk guise! Resurrected from death, Betty finds that she has also been subjected to a process that granted her superhuman physical power that transforms her in the behemoth known as Red She-Hulk. Taking a moment to pose after a hard-fought victory, Red She-Hulk stands on a battered street flexing her considerable muscles. Red She-Hulk wears a form-fitting black body suit with purple striping that accentuates her out of this world physique, with matching boots and fingerless gloves. Powerful and deadly, Red She-Hulk is heavily muscled but still feminine and beautiful, a look perfected by this Bishoujo presentation. Red She-Hulk smiles at you with the fully confident that her power and beauty will guarantee a place in your collection! Red She-Hulk stands just over 9 inches tall (1/7 scale) as she poses on her smashed street terrain base. There’s nothing to fear with this powerful red beauty on your shelf! Limited to just 1500 pieces, an exclusive pre-order for non-attendees begins Friday, 6/26 at 10AM PST on kotous.com! See the new photos by reading on.